Stewart and Lisa Schmidt, Keldron, South Dakota. Rick Jordan, Sturgis, South Dakota. Reich Ranch is a solid rancher seedstock program where their Charolais cattle have found strong favor with area cattlemen. 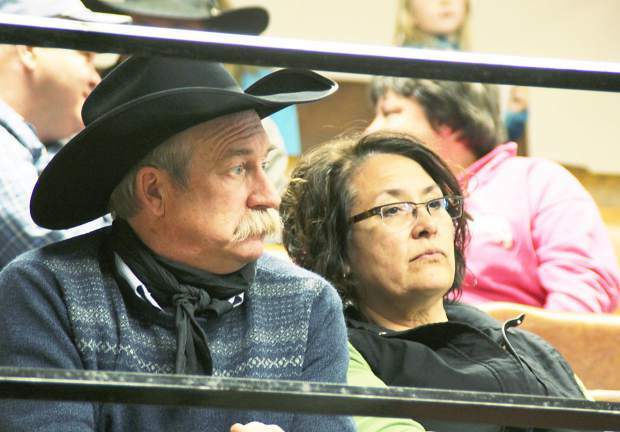 Tim and Ree Reich hosted a good crowd for their best bull sale ever at Belle Fourche Livestock. The Reichs have been in the Charolais business for a long time—this was their 58th annual sale. They produce a consistent set of Charolais bulls that are sold to mostly repeat buyers. These bulls were well-grown, and they had produced a lot of muscle mass. The average birth weight of this offering of bulls was 84.8 pounds, and the average 205 day weaning weight was 650 pounds. They had had no creep feed. These bulls were strong on quality, uniformity, proven genetics, and were presented in ideal condition for rancher acceptance. 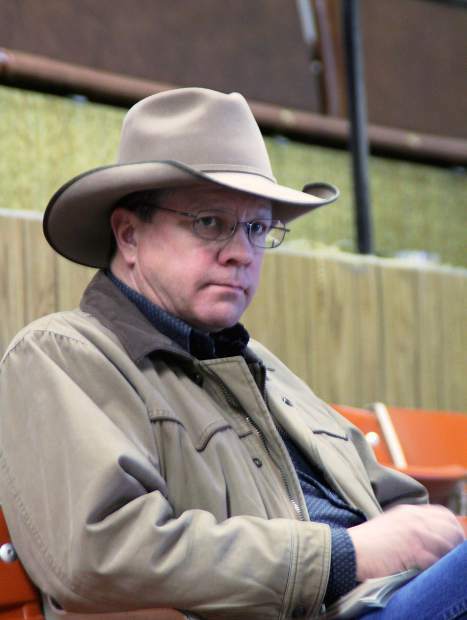 Tim gives an unconditional guarantee on his bulls through the first breeding season. The top selling bull of the day was Lot 20, RR Dividend 456P, a son of Eatons Dividend 20042 polled. Born at 79 pounds, he weaned at 672 pounds to index 105 and had a yearling weight of 1,265 pounds to index 114. He had a 14 sq. in. rib eye and an IMF of 3.34 to index 122. His EPDs were BW 0.0, WW 34, YW 67, MILK 7 and TM 23. He sold for $8,750 to Little Ranch Company, Inc., Leiter, Wyoming. Little Ranch also bought Lot 6, a son of Eatons Windsong 10144 polled. This good looking bull was born at 83 pounds, weaned at 698 pounds and reached a yearling weight of 1305 pounds to index 117. His EPDs were BW 0.6, WW 23, YW 48, MILK 8, and TM 20. He had a 39 cm. scrotal measurement and a 15.5 sq. in. rib eye to index 116. His purchase price was $7,500. Two other bulls sold at $7,500 each, and they both went to East Gate Ranch, Casper, Wyoming. Lot 55 was a son of Eatons Ally 9089 and was out of a daughter of VCR Sir Duke 2129P. He hit the ground at 84 pounds, weaning at 698 pounds, and growing to a yearling of 1,235 pounds to index 111. With a 41 cm. scrotal measurement, he had EPDs of BW 0.9, WW 33, YW 57, MILK 7 and TM 23. Lot 56, also worth $7,500, was a son of Eatons Disco King 10269 polled, and had EPDs of BW 1.5, WW 41, and YW 72. This bull knew how to grow. He started at 89 pounds, reached a weaning weight of 720 pounds, and then attained a yearling weight of 1,350 pounds. With a 39 cm. scrotal measurement, he had a rib eye of 16.55 sq. in. to index 125. The next four bulls were all at $7000. Little Ranch got Lots 8 and 38. Lot 8 had an IMF of 3.44 percent to ratio 115. He was a son of Eatons Insider 00418, and out of a daughter of VCR Sir Duke 2129P. Born at 83 pounds, and weaning at 720 pounds, his EPDs were BW 0.6, WW 41, YW 72, MILK 3, and TM 23. Lot 38 was born at 87 pounds, sired by Eatons Traceable 9448. His EPDs included BW 1.4, WW 33, YW 59, MCE 7.9, and TM 23. He had a 43 cm. scrotal and an IMF of 3.41 percent to index 114. Quint and Jody Moreland, Red Owl, South Dakota, made a good selection with their purchase of Lot 15 at $7,000. This son of Eatons Insider 00418 was born at 91 pounds, weaned at 752 pounds, and posted a yearling weight of 1,360 pounds to index 122. His EPDs were BW 1.1, WW 36, YW 68, MILK 7, MCE 5.9, and TM 25. The Morelands also purchased Lot 45 at $7,000. Here was a son of Eatons Ally 9089 who was out of a daughter of VCR Sir Duke 2129P. This good-doing bull had gained 4.74 pounds a day. With an 88 pound birth weight, he weaned at 723 pounds to index 113 and reached a yearling weight of 1,360 pounds to index 122. His EPDs were BW 0.9, WW 33, YW 58, MILK 9, and TM 26. What a great day for the Reich family…….. and a pretty good day for the rest of us, with the help of Ree Reich's "always good" glazed doughnuts!